JLM Diesel Catalyst Exhaust System Cleaner is an additive that reduces emissions, cleans the exhaust system and actively addresses soot particles, directly resulting in emission reduction. JLM Lubricants, the innovator behind, amongst others, the successful DPF Cleaner has added a new product to its ever-expanding JLM family. Meet the JLM Petrol or Diesel Catalyst Exhaust System Cleaner. Without exaggeration, we can say that it is the best scientifically tested exhaust cleaner on the market. Where competition has stopped innovation or even uses two different bottles for a single power source, JLM offers one formula per motorization – one for petrol and one for diesel engines. A suchlike specific and uncompromising additive is the only way to achieve the best results. After all, a petrol engine is fundamentally different than a diesel power source. Prevention is better than cure, on that we all agree. Yet we do not always act accordingly, particularly when it involves our car. Over time, fuel mixtures can cause build-up of harmful deposits in the engine, reducing fuel system efficiency and damaging costly sensors. These unwanted deposits take away engine power, have a negative impact on fuel consumption and increase emissions, ultimately leading to extremely expensive workshop repairs. However, a problem is only a problem if no adequate solution exists. And there is one: JLM Petrol or Diesel Catalyst Exhaust System Cleaner. Petrol and diesel engines produce different types of emissions. The unique JLM formulas are actually a mix of different active components, each of which has its own task. The petrol variant, for example, contains an octane booster that increases octane levels by 2-4 points, to prevent valve seat erosion, irregular stationary operation and dirty spark plugs. The JLM Diesel Catalyst Exhaust System Cleaner, however, is the only exhaust cleaner on the market that actively targets soot particles. Even though other parties claim that their product cleans the soot filter, JLM is truly unique in this. The JLM cleaners, both the petrol and diesel variant, are multifunctional additives that provide the most effective emission reduction available. After all, they have proven to perform better than the competition. The JLM Petrol or Diesel Catalyst Exhaust System Cleaner will offer you more value for your money, much better cleaning performance and better overall product satisfaction. Most car owners do not think at all about the catalyst under their car, until a warning light on the dashboard lights up. Time for panic, or perhaps not? 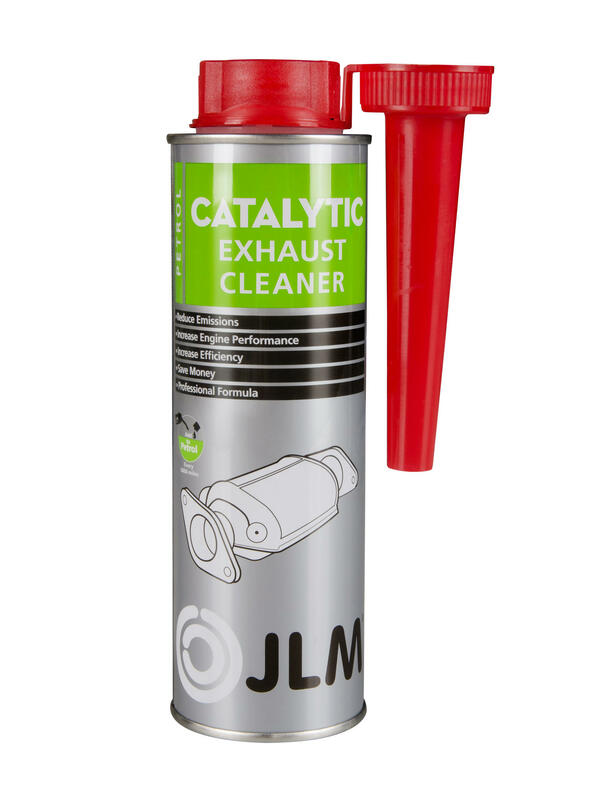 Dealers and car workshops charge exorbitant repair and/or replacement rates; however, an adequate and affordable solution is there for the taking, thanks to JLM and its new Petrol or Diesel Catalyst Exhaust System Cleaner. Keep in mind, that a malfunctioning exhaust is one of the most common causes for MOT test disapproval. A mere single treatment with JLM Petrol or Diesel Catalyst Exhaust System Cleaner will in most cases address the actual root of the problem. The specific JLM cleaners will reduce emissions to an acceptable level and thus avoid expensive repairs. The new JLM Petrol or Diesel Catalyst Exhaust System Cleaner is incredibly easy to use. It could not be more simple: Open, add, start and drive. Pour the additive in the fuel tank when it is nearly driven empty. The cleaner now will blend with the remaining fuel in the tank. Then drive at least 8-10 miles, or until the fuel indicator lights up. Fill up the fuel tank and drive like you do on all other days. The JLM Petrol or Diesel Catalyst Exhaust System Cleaner will now do its work in the background. To keep the exhaust system in optimal condition, it is recommended to add JLM Petrol or Diesel Catalyst Exhaust System Cleaner to the fuel every 5,000 miles.